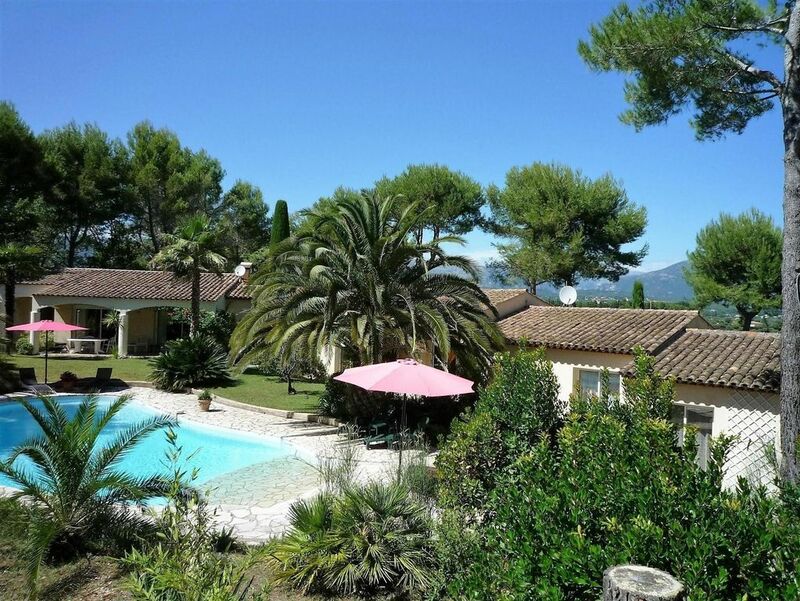 Domaine La Tourmaline : Charming villa on the top of a hill, views on the valbonne village and the castle of castellaras, in a green peaceful parc of 4200 m2, 3 golfs at 10 mn, easy access to the sea, non smoker preferred, Internet wifi. Villa with high ceilings (kitchen, living room: creepy: B: 2.60 m). Parking and private garden, access to the private pool shared with the owners. LCD TV: French channels TNT + Astra (international channels in clear). We had a very enjoyable stay. The house is extremely comfortable, well equipped and was very clean on arrival. The views at the front of the house are amazing and the back of the house looks over the garden and the swimming pool area which are equally amazing. Serge and Françoise were discrete hosts but very accommodating and always available to answer any questions we might have. We completely recommend their property for whoever is looking for a relaxing break in a beautiful setting. Thank you, Serge and Françoise! Beautiful setting and pleasant hosts. The villa is situated in a peaceful location and only 25 minutes walk into the main town of Valbonne. Great private pool and spacious accommodation. Valbonne itself is charming. Clean, comfortable, quiet, and very nice owner. We stayed there with two little kids and we all had a lot of fun in the pool. Francoise & Serge, thank you again for everything, and an extra thank you for sending the sheet we forgot! We are happy that you have appreciated your stay in La Tourmaline, we try to do our best for making your stay as confortable and cool as we would exepted for us. We wish you all an happy new year hopping to see you again in the future. Monsieur Curdy and his wife were superb hosts and made us feel very welcome. The setting is spectacular, the pool was an extra delight and the location is excellent for exploring the Cote d'Azur and environs. We had a very memorable time and enjoyed the peace and quiet at the end of the day. We would love to go back in future. We highly reccomend this location! For the second time we had a very nice time in the villa of Mr. and Mrs. Curdy! Superbe! We enjoyed our stay very much. Lovely house, although part of villa. Car very much needed as far away from nearest shop boulangerie. Clean, friendly, quiet, beautiful view.